When we selected creativity as the theme for the Hour of Code in 2018, we had no idea just how much it would resonate with students and teachers around the world. We are amazed by all of the teachers, event organizers, and international partners who celebrated Computer Science Education Week in 2018. The Hour of Code reaches millions of students worldwide every year, and it wouldn’t be possible without your hard work and tireless efforts. Thank you! We were excited to see so many student creations during the Hour of Code, but we’re even more excited to see the momentum continue through 2019 as we work together to expand access to computer science. An Hour of Code is a great start, but it’s just a start. 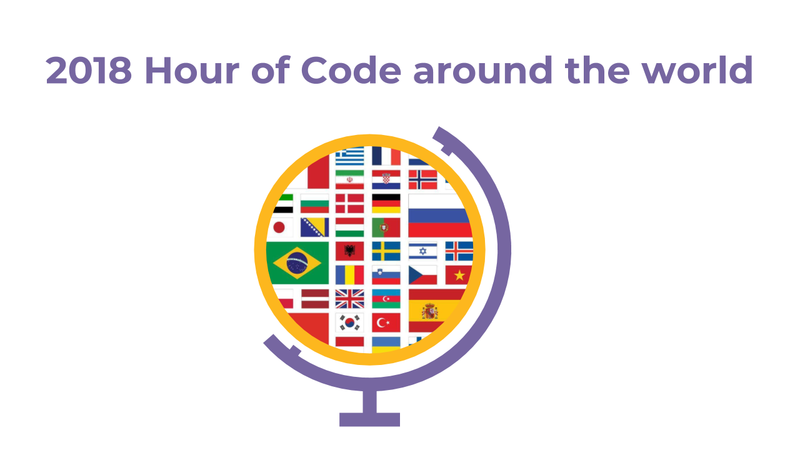 We’re happy to report that international excitement about the Hour of Code has reached an all-time high: over 70% of all Hour of Code events in 2018 occurred outside of the United States. Check out the 20 countries that had most events registered on hourofcode.com in 2018! We love seeing Hour of Code events taking place in schools. We hope many schools will go beyond an Hour of Code to continue teaching computer science to all students. The countries below had the highest number of events occurring in-school. Saudi Arabia had a great year participating in the Hour of Code, recording the highest number of events per capita. The countries below had the highest number of events per capita, where the total number of events was greater than 10. Thanks to the hard work of many event organizers, Cambodia saw an extremely impressive increase in the number of Hour of Code events. The countries below had the highest growth rates in total number of events, where the number of 2017 and 2018 events were greater than 1. We couldn’t have made this progress without you, and we need your help to keep the momentum going. Are you a teacher? Start teaching computer science today! Our comprehensive and easy-to-use curriculum is available to you at no cost. Can you help translate Code.org content into other languages? Visit code.org/translate for more information. Is your organization looking for ways to bring computer science to your country? Check out code.org/international. Are you passionate about computer science? Volunteer to help inspire students in your area. Thank you for helping us to reach students all over the world!